In a new exclusive study, we reveal the academic backgrounds of the world’s top CEOs. We address a range of interesting questions: Do CEOs need an MBA or even a Master’s degree? How important is international academic experience? And how many women hold the top management posts? As the basis for our analysis, we picked the largest companies on each continent as per the Forbes Global 2000 company ranking. In total, the analysis includes the backgrounds of 231 top company leaders. their age, gender, and nationality. In the article below, we highlight the findings of this survey. Chief Executive Officers are generally well-educated professionals. 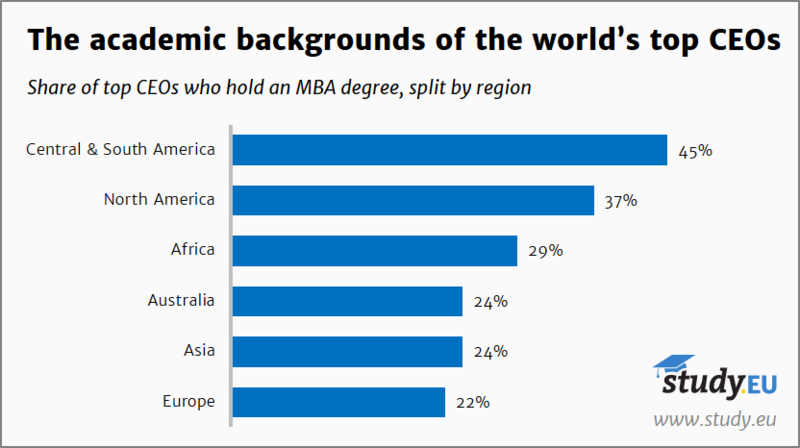 Globally, 97% of the sample hold at least a Bachelor’s degree; 64% hold at least a Master’s degree or equivalent (including MBAs); and 10% hold a Doctorate degree. Chinese top CEOs seem to be the best-educated. All of them have at least an undergraduate degree, and 33% even hold a doctorate, the highest value worldwide. In Europe, Master’s degrees are the norm among top managers, at 76%. 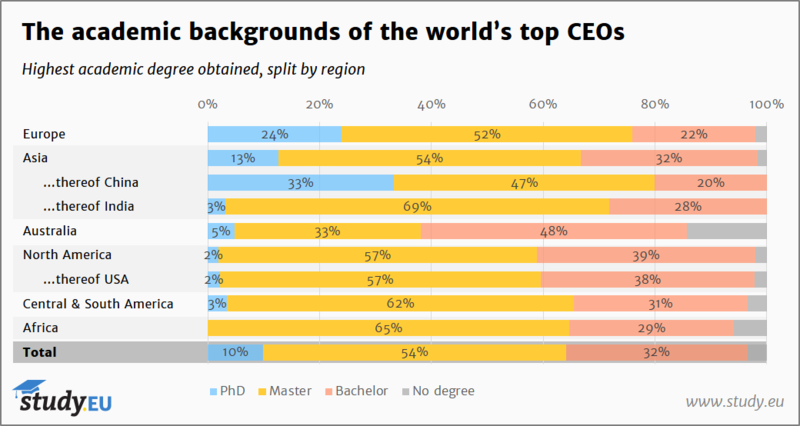 Meanwhile, 59% of North American CEOs have obtained at least a Master’s degree. 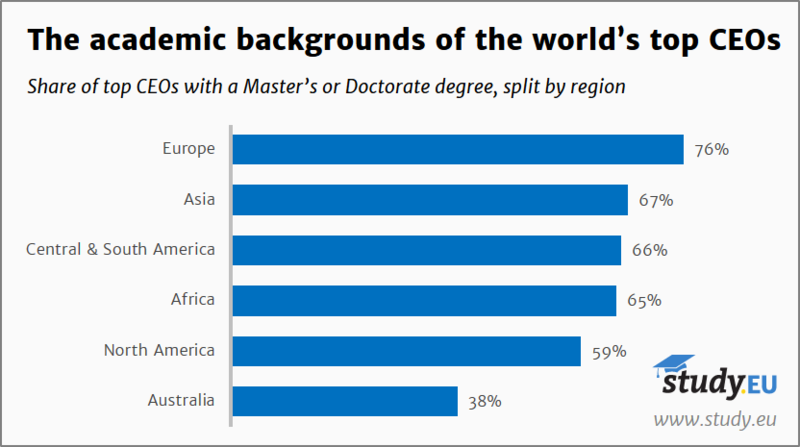 Australian companies seem to be the most permeable for those without high academic accolades: 14% of company leaders have no university degree at all, and only 38% have a Master’s or Doctorate degree. Australian CEOs were also the youngest, although their average age of 54 was not far below the global average of 57. Over the past decades, many studies have found a strong correlation between the diversity of executive or advisory boards and the financial performance of companies, especially with regards to gender diversity. Recent studies include, for example, “Is Gender Diversity Profitable? Evidence from a Global Survey” by the Peterson Institute and EY, or the Women Matter report by McKinsey & Company. The rationale is that diversity allows teams to approach problems from various perspectives, avoiding the risks of a “yes men” herd mentality. Of course, this is true on any level within an organisation, and not just the top leadership. However, the top management position is generally still a male domain: Only 3% of the CEO posts in the data sample are held by women. Out of the mere six female CEOs, four are heading US-American companies, and two are heading Indian companies. In contrast, the share of CEO posts held by foreign nationals is relatively high: 18% were born and raised in other countries than their corporation’s headquarters. That ratio is highest in Australia with 43% (predominantly from the UK and New Zealand) and Europe with 36%; yet lowest in Asia with only 2%. Although it is no replacement for actual diversity in teams, studying abroad is a great way for individuals to leave their comfort zone, get to know foreign cultures and concern themselves with new perspectives at a young age. That is one reason why top managers who studied overseas are generally in high demand for important positions. 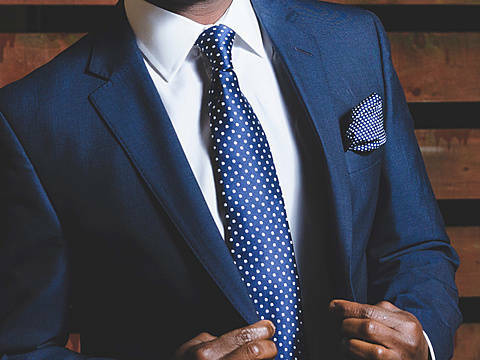 37% of North American CEOs, and 45% of Central/South American CEOs hold MBA degrees. That means that in those two regions, two thirds of those with any Master’s degree hold a Master of Business Administration. That share is significantly lower in Europe: While the share of CEOs with a Master’s degree is higher (76%), only one third of those went to business school to get an MBA. Instead, technical, scientific or legal degrees are the norm among European company leaders. The data shows that 32% of the world’s top CEOs studied abroad for at least one semester. Depending on what sources you trust, only around 6% of all tertiary students worldwide get to go abroad during their studies; and that number, of course, does not even account for all those that do not get the chance to attend university at all. In any case, it is safe to say that when it comes to study abroad experience, CEOs exceed the average by far. Conversely, that means students that want to lay the groundwork for one day becoming CEOs should consider to study overseas. 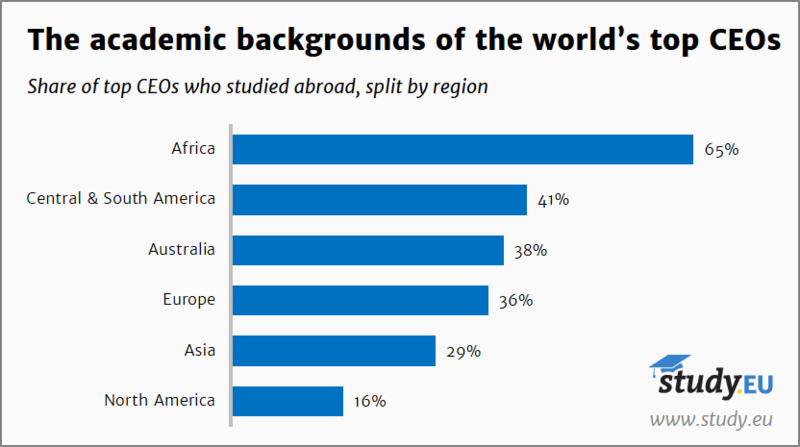 Surprisingly, although most of the world’s global players are US-based, among all CEOs in the sample, the Americans have the least international experience: Only 11% studied abroad. In contrast, 65% of African CEOs went abroad to study, the highest value for any region in our dataset. Analysing the data further, we reveal an interesting trend: Looking only at the younger third of CEOs, the share of those who studied abroad rises to 41%. This fits well with the global long-term trend of increasing student mobility (see, for instance, the OECD). 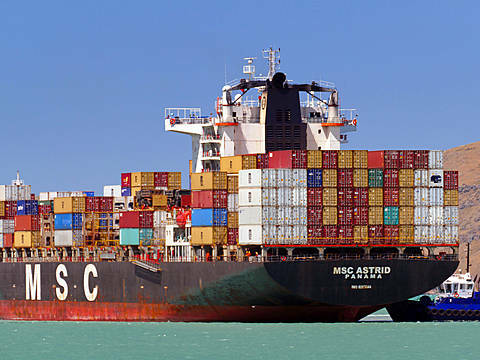 It is much more common among today’s students to spend part of their studies abroad. And it implies that future generations of CEOs are even more likely to have studied abroad at some point during their academic education. Cover photo collage credits: Carlos Ghosn by Gobierno Aguascalientes (CC BY-SA 2.0); Joe Kaeser by the Kremlin (CC BY 3.0); Warren Buffett; Mary Barra; Indra Nooyi by Presidencia de la República Mexicana (CC BY 2.0); Mark Zuckerberg by Presidencia de la República Mexicana (CC BY 2.0); Satya Nadella by Dan Taylor/Heisenberg Media (CC BY 2.0); Tim Cook by Valery Marchive (CC BY-SA 2.0); Matthias Müller by Volkswagen (CC BY 3.0); Andrew Mackenzie by The Royal Society (CC BY-SA 3.0); Anand Mahindra by Public.Resource.Org (CC BY 2.0); Akio Toyoda by Moto "Club4AG" Miwa (CC BY 2.0); Kenneth Frazier by Merck (CC BY-SA 3.0); Doug McMillon by Walmart (CC BY 3.0); James Dimon by Financial Times (CC BY 2.0); Tom Enders by Stephan Röhl / Heinrich-Böll-Stiftung (CC BY-SA 2.0); collage licensable under CC BY-SA 3.0. See CC BY 2.0, CC BY-SA 2.0, CC BY 3.0, CC BY-SA 3.0.